The question with Thanksgiving leftovers is always what to do with them. At Thanksgiving dinner, I like the Turkey and sides to mostly be served in the traditional way. I think the leftovers are the time to get really creative. I’ve loved Monte Cristo’s since I was 9 and spotted one on a menu. Ham, turkey, and cheese between two slices of bread, dipped in a sweet batter, then deep fried??!? And served with jam!? My eyes lit up and from then on every time I saw one on a menu, I ordered it. (Luckily for my health, I don’t come across them too often). To take the traditional Thanksgiving leftover sandwich to the next level, I decided to morph it into a Monte Cristo. I used garlic Texas Toast for the bread with a slice of Drunken Goat cheese on both. Then I added a layer of my Sriracha Beer Injected Cajun Turkey and another layer of leftover ham. 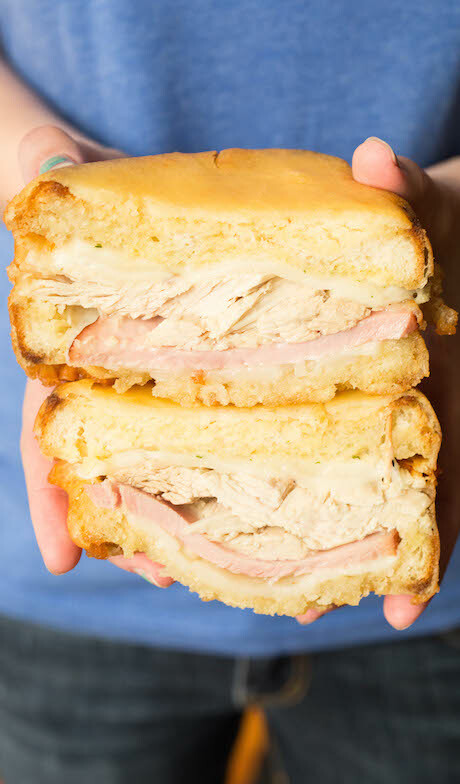 The Thanksgiving Monte Cristo is then dipped in a sweet batter and deep fried to golden perfection. And of course, cranberry sauce makes for the perfect jam. Add flour, sugar, salt and baking soda to a medium bowl. Mix together well. Add the egg and milk mixture to the dry ingredients. Mix together until there are no lumps. Assemble the sandwich. Use the texas toast for the bread. 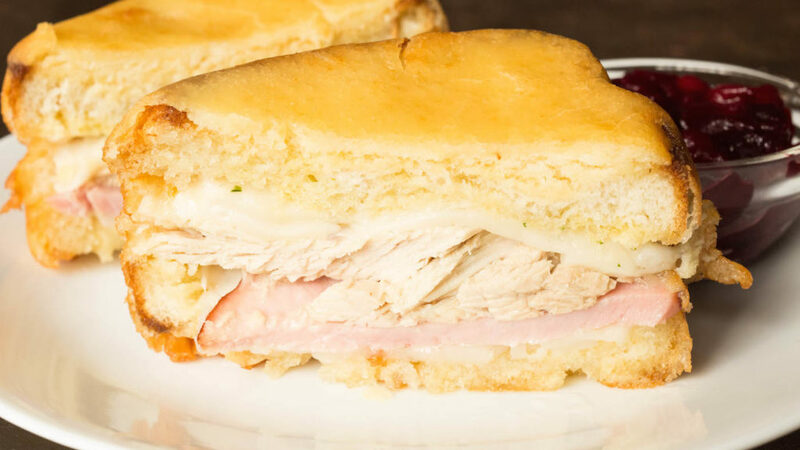 Place a slice of cheese on the bottom piece, then layer the ham and turkey, top with another slice of cheese and the top piece of texas toast. Place a toothpick in each corner of the bread. Fry in a deep fryer, or in a cast iron skillet with canola oil. Fry only a few minutes, until golden brown. 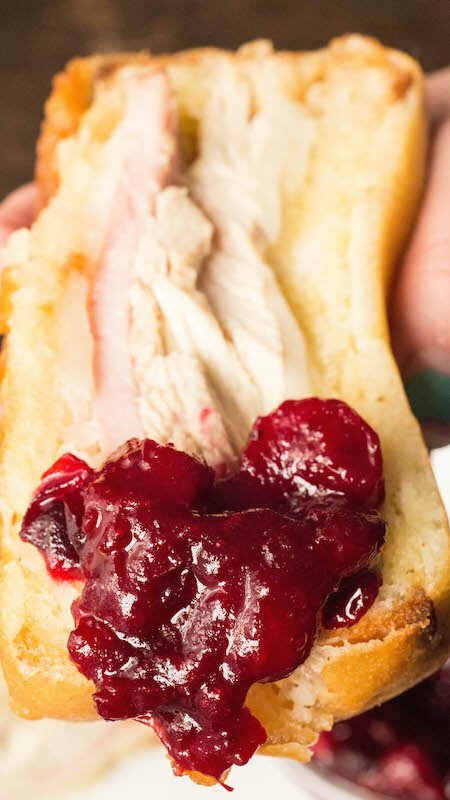 Slice down the middle, serve with leftover cranberry sauce, and enjoy!